Kierra Jones is a freshman at MU. She works in the Black Studies Department and helped organize the event. “I really enjoyed it because I’m a freshman so I wasn’t here last year with everything going on campus so it’s really good just to really hear the insight on everything, how everyone feels and what they feel the growth is from last year what we should do to move forward," Jones said. 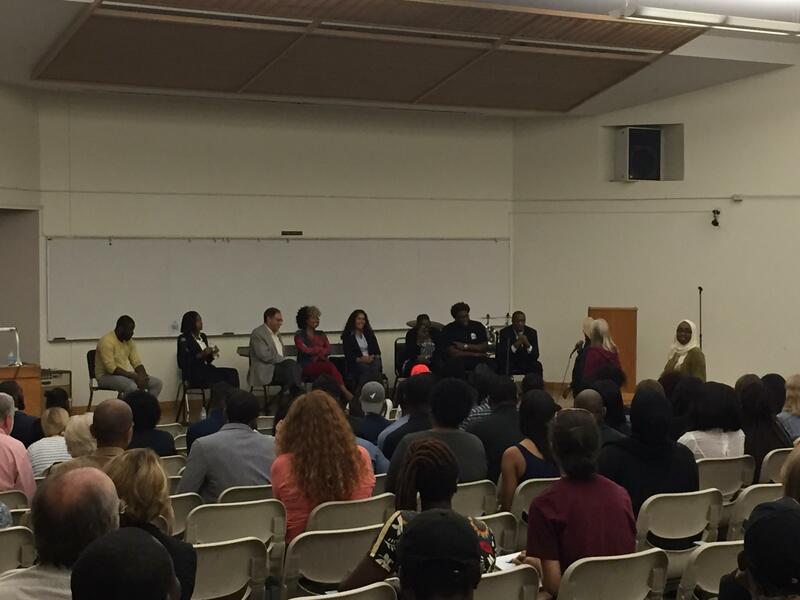 Following the performances, Hill moderated a panel including student demonstrators, professors at the university and community organizers. He emphasized the panel was meant to find tangible ways to continue to work for change on campus. Topics ranged from how to approach topics like privilege on a predominantly white campus, to the national perception of last semester’s protests due to media representation. One reoccurring theme was how conversations surrounding race often occur in a black and white binary, and how to unify the movement. Amalia Dache-Gerbino, one of the members of the panel, teaches in the Department of Educational Leadership & Policy Analysis. She says that the binary includes people who may not see themselves as black because the institutions and structures marginalizing students affects all racial minorities. One way Dache-Gerbino says we can nuance these conversations is by adding historical context to conversations of racism on campus. Quay, a freshman at MU, says now that she has learned the history behind student protests on campus and seen support from other students she’s inspired. “What stood out to me at this event was to find that people cared. Especially people that aren’t my color, so seeing white, Caucasian people coming and talking on behalf of use made me feel like we aren’t as alone as I thought we were on campus," she said. She said she wants to look for small ways to communicate with others to create more openness. “I feel like I would probably talk to more Caucasian people, not only just talk to them but about African-Americans and let them know they shouldn’t be intimated by us, so that could be one of the reasons and actually understand where they’re coming from and hopefully they can do the same with me," Quay said. Those kinds of conversations are what Hill, the moderator, said need to continue past this event, having conversations that aren’t always comfortable, but committing to listening to people despite differences.